A fluorescent microscope is an optical microscope that is used to observe specimens that undergo a fluorescence or phosphorescence stage. The specimen has small molecules called fluorophores attached to it. These fluorophores emit light when irradiated with a specific wavelength of light. This causes the specimen to be illuminated from within the specimen itself, generating a much more detailed image. The molecule used in making the specimen fluorescent is the green fluorescent protein (GFP). It gives off a bright green fluorescence when exposed to light in the blue to ultraviolet range. GFP is generally safe to use when illuminating live cells. This imaging technique has revolutionized molecular biology. But since fluorescent microscopes are optical in nature, this technique cannot be used with electron microscopes. Optical microscopes uses light beams to image a specimen, electron microscopes use beams of electrons to produce a magnified image. Now, chemists from MIT have found an equivalent to GFP for electron microscopes, this new tag will allow scientists to label and visualize proteins with unprecedented clarity. “With things that may appear only a few pixels across by fluorescence microscopy — for example, a mitochondrion — you can’t make out any of the internal features. But with electron microscopy it’s very easy to discern the intricate internal structures,” says Jeff Martell, a graduate student in chemistry at MIT and lead author of a paper describing the new tag in the Oct. 21 online edition of Nature Biotechnology. This discovery will better image cell proteins. Prior to the discovery, scientists would use Horseradish peroxidase (HRP) as a tag. The limiting factor for HRP is that it only works only in a few locations or compartments within a cell. Peroxidases removes an electron and a proton from other molecules in a process known as oxidation. This oxidation can be imaged by electron microscopy. Every peroxidase has different targets, and one of HRP’s main target is a molecule called Diaminobenzidine (DAB). The researchers looked at a similar protein to HRP; ascorbate peroxidase (APX). Also a peroxidase, APX is more versatile than HRP bcause it can function within a cell’s cytosol, in the main cavity of a cell. The researchers genetically engineered APX so that it would also target DAB and renamed it APEX for "engineered APX". Using DNA containing the APEX gene, they attach it to the gene for the protein they want to image. The cell then produces the target protein, bound to the APEX protein. DAB is then delivered to the cell. When APEX starts oxidizing DAB, the radicals generated during this process form a tarlike polymer that can be detected by the electron microscope. This allows the researchers to pinpoint the location of the target protein. By knowing the exact location of a protein, it can give scientists a better understanding of its functions. 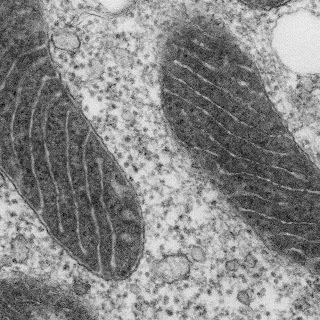 In this electron microscope image of a mitochondrion, the matrix has been stained with APEX, making it appear dark. The lighter projections into the matrix represent the intermembrane space. Apex was used to determine the location of a calcium channel protein discovered last year. Using the technique, they found that it is embedded in the inner mitochondrial membrane and faces into the innermost part of mitochondria, the mitochondrial matrix. Using APEX will make it easier to study neurons. They can trace the connections the neurons make to other neurons. 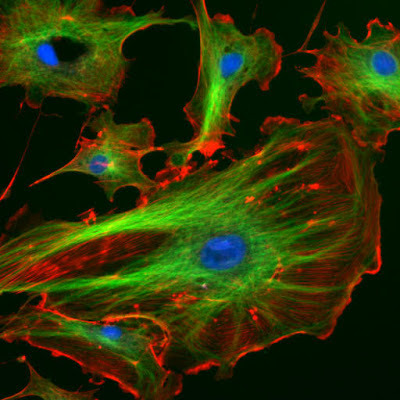 “We want to find the exact connections that these cells are making, and APEX is a good way to label cells for electron microscopy. We can label specific types of cells and figure out how they fit into the neural circuitry,” says Joshua Sanes, a professor of molecular and cellular biology at Harvard University. Jeff Martell and Alice Ting, the Ellen Swallow Richards Associate Professor of Chemistry at MIT and senior author of the Nature Biotechnology paper, invented the new technology and are now looking at ways to make APEX more stable.